Today, I’m excited to introduce Rachel from Rachel Cooks! I can thank Rachel for getting me hooked on making homemade granola. Like this Almond Mocha Granola. Rachel also hosted a Pancake Party this past July. She has 31 pancake recipes on her blog from sweet to savory and everything in between! Rachel and I share a similar pallet when it comes to food. We both eat our fair share of veggies and that’s why I think I’ve levitated to her blog and make her recipes regularly. The most recent recipe I made from Rachel was this Angel Hair Pasta with Roasted Red Pepper Sauce. If your looking for a quick and easy dinner this is the dish for you! Hi readers of Katie’s Cucina! I’m Rachel from Rachel Cooks. If you don’t know me, feel free to stop by my blog and learn more. I won’t bore you with all the details here–I’d rather get straight to the food! I realize that this is sorta of summery…and it’s sorta fall (is it fall? ), but it really is great for any time of the year. 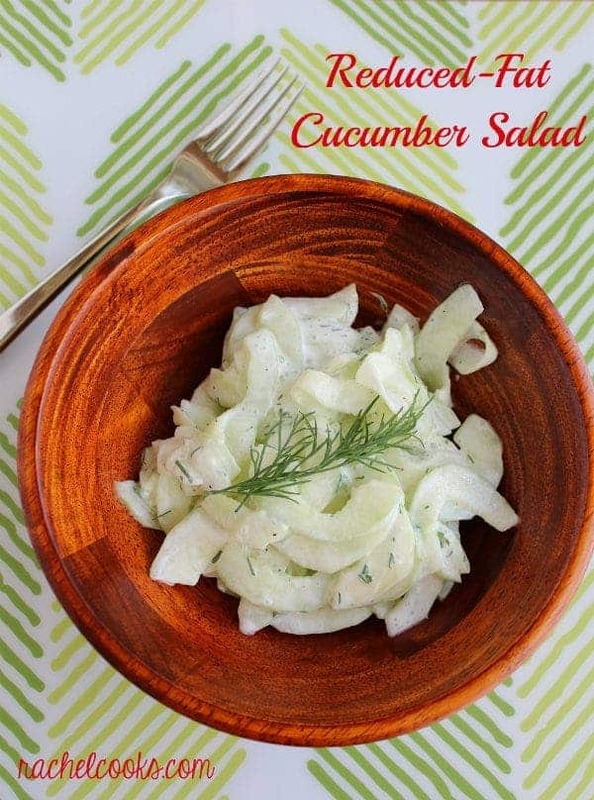 Cucumbers are always available–so as long as you can find the dill for this recipe you’re good to go. 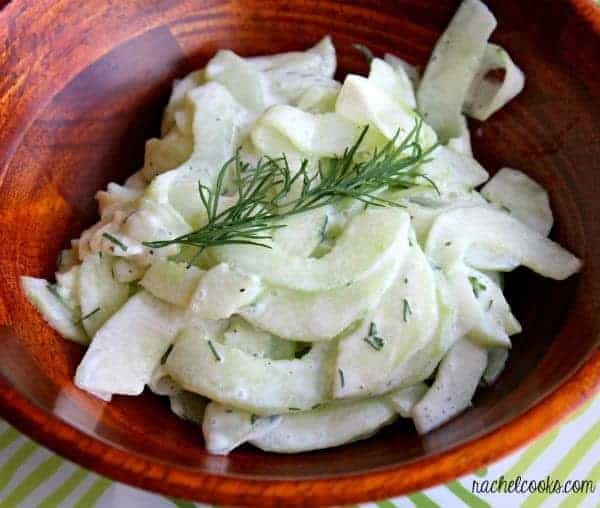 I used regular cucumbers for this recipe, but if you can find English cucumbers you can probably get away skipping the seeding and peeling part since they more tender skin and less seeds. Enjoy this easy recipe, with less guilt than it’s full-fat sister! In a medium bowl, combine all ingredients except cucumbers. Use a whisk or a fork to combine until smooth. Add cucumbers and stir to coat. Refrigerate until ready to serve. Best consumed the same day it is prepared. Verdict: So delicious. Refreshing and a perfect side dish or snack. Husband’s take: Ben is not a huge fan of sour cream, but he enjoyed this salad! Difficulty: So easy! Especially using the food processor–it takes half of the work out of the recipe! Thanks for having me, Katie! Hope you’re having a fantastic vacation! 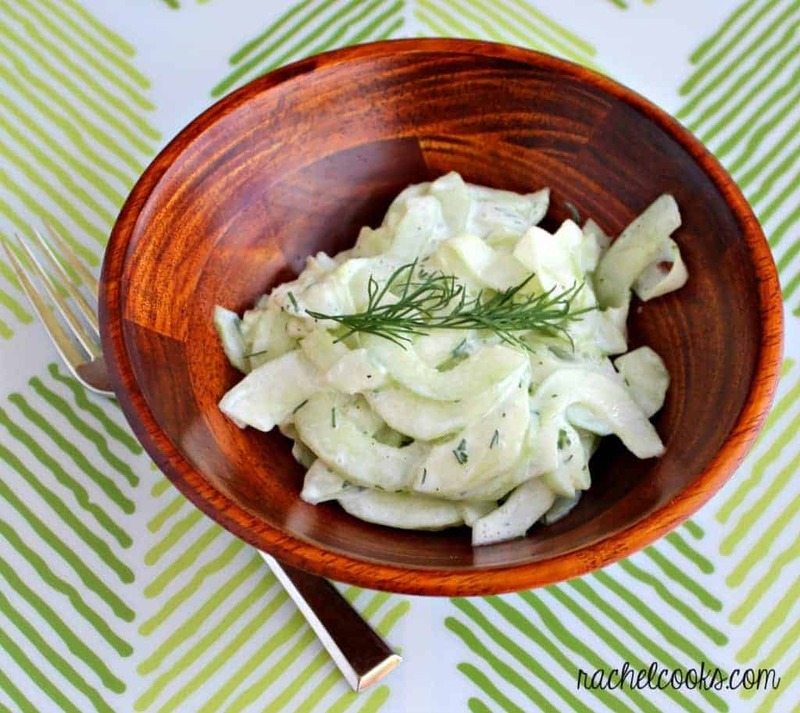 This cucumber salad will make a healthy snack! I love the fresh dill flavor. I love this, Katie and Rachel!! without the guilt is great! Hope you’re having fun, Katie!!! I misss youuuuuuu!